MacPHERSON, ISABEL ECCLESTONE (Mackay), author; b. 24 Nov. 1875 in Woodstock, Ont., third daughter of Donald MacLeod MacPherson, a marble cutter, and Priscilla Eliza Ecclestone; m. there 22 April 1895 Peter John Mackay, and they had three daughters; d. 15 Aug. 1928 in Vancouver. Noted for her warmth and ambition to achieve, Isabel (Belle) MacPherson grew up in the Scots community of Oxford County, Ont., where she won prizes in Highland dancing. She was educated at Woodstock Collegiate Institute, and her first work appeared in school publications. At 15 she began publishing poems and short stories in Canadian newspapers and magazines. From 1890 to 1900, under the pseudonym Heather, she was a staff contributor to the Woodstock Daily Express. Miss Witterly’s China (Toronto, ), a magazine story reprinted in pamphlet form for the Woman’s Missionary Society of the Methodist Church, and Pansies for thoughts (1898), poems printed by the Woodstock Public Library, were her first books. Her work reached a wider audience through inclusion in Selections from Scottish Canadian poets (Toronto, 1900) and especially upon its collection in Between the lights (Toronto, 1904), published by William Briggs. Her reputation was firmly established when she won the Toronto Globe’s prize for the best poem on a Canadian historical subject in 1907 and again in 1910. Marriage in 1895, births in 1902 and 1904, and the family’s move to Vancouver in 1909, when Peter Mackay became chief reporter (stenographer) of the British Columbia Supreme Court, did not slow Isabel’s career. Fees from her writing paid for a housekeeper, who freed her for literary activity. Her daughters, who would remember her playfulness and absentmindedness, were the first audience for the many poems and stories she contributed to periodicals for young people. A selection of her poems republished in The shining ship, and other verse for children (Toronto, 1918) confirmed Mackay’s name as a lyric poet with a good rhythmic sense. It would be hailed as a “Canadian classic” in 1930, though an American reviewer in 1918 thought it imitated Robert Louis Stevenson with “a halting, shambling gait.” Mackay’s most enduring work has been this poetry of childhood, which was included in school readers until 1967. The move to Vancouver had “a stimulating effect” on Mackay, as she had predicted it would in the Canadian Bookman (Toronto) in April 1909. “Thin ice,” serialized the following year in the Canadian Courier (Toronto), marked her shift to longer fiction. Prose, she later observed, “is good mental training and not dependent upon a moment’s mental exaltation.” Her literary circle expanded through the Canadian Women’s Press Club, a major force in the struggles of first-wave feminism; she was the founding president of the club’s branch in Vancouver in 1910 and in 1913–16 she served as vice-president for British Columbia and Alberta. In an era when the “new woman” sought equality in the public sphere, journalism and literature were the favoured professions. Mackay’s feminism was low-key – a review of Olive Schreiner’s classic Woman and labour in March 1912 in the women’s weekly the Chronicle or a casual remark about women’s suffrage in the dialogue of a character in The window-gazer (Toronto) in 1921 – but feminism did inform her fiction, where she examined the psychological dynamics of power in families and other relationships. Through her circle Mackay established intimate friendships with two of the foremost poets of her generation, Emily Pauline Johnson* and Marjorie Lowry Christie Pickthall. She helped nurse them during their final illnesses and facilitated production of their last books, as an executive of the trust fund that supported Johnson through the publication of her Legends of Vancouver (1911) and as hostess to Pickthall, who composed The wood carver’s wife (Toronto, 1922) at Mackay’s summer camp on Boundary Bay, south of Vancouver. In an appreciation of Pickthall, Mackay made her only explicit pronouncements on poetics: in seeing poetry as a mystical escape from everyday constraints, her views were typical of late-Victorian romanticism. It was laughter, however, that cemented friendship. Johnson had an “excellent sense of humour,” Mackay wrote, and it helped balance her “differing legacies”: the emotion of Amerindian oral eloquence with the literary sensibility of the European tradition. Mackay’s narrative model in Indian nights (Toronto, 1930) is indebted to Johnson’s “translation” of both the method and the content of Indian legends into English story form. Over the course of her career, Mackay too was known for her humour, as well as for her “philosophic turn of mind” and a “note of yearning” balanced with a “concreteness of sensuous impressions.” These qualities were evident in Fires of driftwood (Toronto, 1922). Inspired by the Boundary Bay campfires, it shows Pickthall’s influence in the title poem – a rare experiment in free verse – and in the final elegy. In the only critical study of Mackay’s work, written in 1942, Louis Dudek sees in the title poem a “strange magical flavour” that might have made Mackay “outstanding” had she been consistent and able to sustain an emotion or to accord idea and form as she did in the subtle rhythm of “Fear,” another of her poems. Instead, most of her poetry is marred by fanciful flights, “light personification,” “superficial symbolism,” and jingling rhymes, characteristics that Dudek, from his tough imagist stance, dismisses as “eternally feminine.” In the dominant spirit of literary nationalism of the day, however, author-historian Roderick George MacBeth* hailed Mackay, Johnson, and Pickthall in 1928 as “talented daughters of the Dominion,” praising them for not leaving the country as many male writers had done. Nonetheless, lacking the “fiery sincerity” (Mackay’s words) and dramatic flare of Johnson’s work or the polished craftmanship of Pickthall’s, Mackay’s poetry is primarily of historical interest. Although contemporary critics thought her poetry was her best work, they acknowledged that she was better known as a novelist. Written in the popular forms of the day, her fiction was reasonably well received. The Woodstock Daily Sentinel-Review judged her first novel, The house of windows (London and Toronto, 1912), “a book of promise rather than complete achievement.” Set in a department store, it shows the exploitation of working-class women in a mode of social realism, and both the London Athenæum and the New York Times commented on the originality of the topic and the vividness of the mise en scène. However, a melodramatic plot that terminates in three engagements turns the book into a romance. Love conquers all as Mackay, wary of what editor Melvin Ormond Hammond, in a letter of rejection in 1908, called her “heterodox opinions,” bows to propriety and a reading public seeking uplift. Up the hill and over (Toronto, 1917), which features an all-female family held together by one meagre salary, likewise received mixed reviews. The Canadian Courier claimed that “insanity” was fitting material for “students of morbid psychology,” but not for fiction. Yet the Times Literary Supplement (London) praised the “well-studied picture of a woman who has yielded to the curse of drugs.” The Canadian Magazine aptly compared Mackay’s illumination of commonplace happenings in an obscure Ontario town with Mary Wilkins Freeman’s “local colour fiction” set in New England. This regionalism was a favoured genre of women’s writing, as feminist critics have subsequently shown. From a small town Mackay moved to the city with Mist of morning (Toronto and New York, 1919). Although many Canadian novelists of the period condemned urban life as immoral, Mackay treated it more positively in this novel. First serialized in Canadian Magazine, the work, in the estimate of John Daniel Logan and Donald Graham French, is a “curious” mixture of the “imaginative novel,” which focuses on a protagonist with great dreams living in a Toronto rooming house, and the “realistic romance,” which ends with declarations of love on the eve of World War I. Buoyed by the active little theatre movement in Canada in the 1920s, Mackay wrote a number of plays. Her skill at “snappy dialogue” contributed to her success as a playwright, as well as a novelist, and she won many prizes. The last cache (New York, 1927), first presented at Hart House Theatre in Toronto on 16 May 1927, was described by Lawrence Mason in the Globe as a “clever” sketch and “a grim little revelation of human weakness.” A modern audience would be troubled by the over-reliance on coincidence in plotting and the stereotypical treatment of Chinese and Indian characters. Mackay’s The second lie (Toronto, 1926), which literary historian Michael Tait dismisses as “negligible,” is possibly her best writing, a sustained treatment of domestic violence in tightly structured dialogue. Charles Vincent Massey*, who played the role of the tyrannizing husband in 1926, later wrote perceptively that it was “a sketch in the manner of the ‘Grand Guignol.’” Goblin gold (New York and Toronto, 1933), a comedy in which a relative rescues a mother-led family from genteel poverty in an urban tenement after he strikes gold, was posthumously given a governor general’s prize in 1929. In her lifetime she had received other recognition of her work. 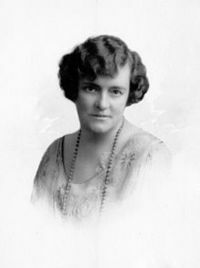 In 1926 she was selected president of the British Columbia branch of the Canadian Authors Association. Two years later she won the prize of the Imperial Order Daughters of the Empire for her short story “Initials only,” a field where she might have done more had not death intervened. Isabel Mackay’s writing was constrained by the lingering puritanism and philistinism that shaped her treatment of modernist topics such as urban malaise and sexuality. Writing for the market place, she was responsive to its norms and so was praised for material that was “interesting but not decadent.” Although her work is forgotten today, she was a prominent member of a dynamic women’s literary community in the early 20th century. Her obituary on the front page of the Globe, following her death from cancer in 1928 at age 52, testified to contemporary recognition of her writing and work in literary organizations. The main collection of Mackay papers, including her publications, clippings, and copies of much of the material located in other archives, is housed in the Lady Aberdeen coll. at the Univ. of Waterloo Library, Special Coll. Dept. (Waterloo, Ont. ), WA 18. Scattered letters and manuscripts are in the Acadia Univ. Library, Esther Clark Wright Arch. (Wolfville, N.S. ); BCA, MS-2367 (I. E. Mackay papers); the Lorne and Edith Pierce Coll. of Canadian Literary mss in Queen’s Univ. Arch. (Kingston, Ont. ), and in the Univ. of B.C. Library, Special Coll. and Univ. Arch. Div. (Vancouver), M399 (I. E. Mackay papers). Mackay’s birth and marriage records are in AO, RG 80-2-0-69, no.15412 and RG 80-5-0-227, no.9376. An extensive list of her published and unpublished writing has been issued as Isabel Ecclestone Mackay bibliography, comp. Susan Bellingham (Waterloo, 1987). Biographical entries on Mackay are found in various standard reference works including The Oxford companion to Canadian history and literature, ed. Norah Story (Toronto, 1967), and the Dictionary of literary biography (207v. to date, Detroit, 1978– ), vol.92 (Canadian writers, 1890–1920, ed. W. H. New, 1990). Barbara Godard, “MACPHERSON, ISABEL ECCLESTONE (Mackay),” in Dictionary of Canadian Biography, vol. 15, University of Toronto/Université Laval, 2003–, accessed April 18, 2019, http://www.biographi.ca/en/bio/macpherson_isabel_ecclestone_15E.html.